Sheila Bonvallat has been a resident of Brevard County for more than three decades, a realtor for 17 years and having gone through the stress of relocating sixteen times, she has been able to combine what she has experienced firsthand and has incorporated that into real estate expertise in order to deliver you the highest quality service. Sheila takes great pride in knowing the area and each of its unique neighborhoods and communities. She has invested in her chosen career in the real estate industry learning how to provide her clients with unparalleled top-tier customer service. “My goal is to make the real estate process simple and stress-free. 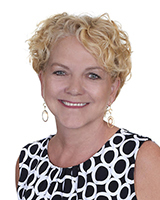 I always focus on delivering that extra personal touch and in providing honest, reliable customer service to each of my clients.” Sheila is Certified in Relocation, she also specializes in short sales, listings and standard residential, condominium and land sales in Brevard County. "My husband and I had the pleasure of working with Sheila to find a home in Merritt Island earlier this year. We have the highest opinion of her, and in our experience with realtors, Sheila leads the pack. Her knowledge and professionalism are top notch. She radiates authenticity and sincerity that made us instantly trust her judgement and her interest in the well-being of our family during our journey to find a home. We flew to Florida for one weekend to look for a home in a place we'd never been before, which felt very overwhelming. On top of that, we had our two young daughters with us, and that added additional stress to our limited timetable. Sheila eased our anxiety and made the experience as seamless as possible. She instantly established a rapport with our family that made the house-shopping experience enjoyable and productive. She took us all over every part of the island and never once lost an ounce of energy or motivation to find us what we wanted. We will continue to work with Sheila and she will come with the highest of recommendations to our friends and colleagues at SpaceX and beyond as we become more established in the area. We extend many thanks to her."